PICTURED: THE SEARCH for Jessie Foster is featured in Lisa Wojna's new book Missing! The Disappeared, Lost or Abducted in Canada. The search for Jessie Foster is featured in a new book highlighting stories of Canadians who disappeared without a truce. Author Lisa Wojna's Missing! The Disappeared, Lost or Abducted in Canada dedicates much of the 264-page book's sixth chapter to the story of Jessie Foster, who went missing in Las Vegas in 2006. Jessie's mom, Glendene Grant, was approached by Wojna in March - almost a year to the day after the family last heard from Jessie, 22. "There's lots of different cases in the book. Most have no resolution," Grant said Sunday. "The book has been in the works for months and was released just last week." Wojna conducted several phone and e-mail interviews with Grant. The women will meet in person next month at a fundraiser to help continue the search for Jessie. Other stories include the Robert Pickton case and the Highway of Tears investigation. Grant said true-crime books like Wojna's are very popular. She hopes Missing! will introduce Jessie's story to a new audience and create new leads in the investigation. "I hope it will get her story out there more," she said. Grant is convinced her daughter is being held against her will. Jessie started dating Peter Todd shortly after moving to Las Vegas. Todd, a pimp separated from his wife, a prostitute, had a lot of money, fast cars and all-night parties - things that may have lured Jessie into the lifestyle. Todd has told investigators he has no idea where she is. Efforts to find Jessie are expensive. Anyone who would like to contribute to the Jessie Foster Fund can make a donation at any CIBC branch, transit No. 00050 and account No. 98-27412. For more information, go online at www.jessiefoster.ca. Missing! 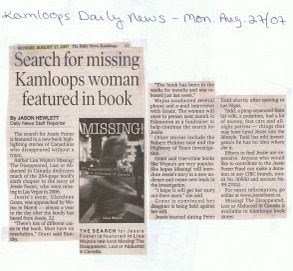 The Disappeared, Lost or Abducted in Canada is available in Kamloops book stores.